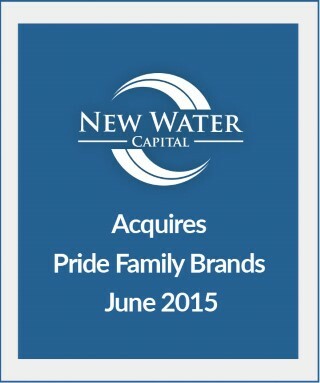 BOCA RATON, FLORIDA (July 1, 2015) – New Water Capital Partners (“New Water”), an investment firm, announced today that its affiliate has made an investment in Pride Family Brands (“Pride”), a leading manufacturer and distributor of outdoor furniture in North America. Headquartered in Fort Lauderdale, Florida, Pride designs, manufactures and distributes hand-forged artisan quality aluminum outdoor furniture under the Castelle, Prestige and Expressions brands, and designs and supplies promotional outdoor furniture under SummerWinds and private label brands. Pride was founded over 30 years ago by Bernie Lowsky and his sons Jamie and Steve Lowsky, who successfully grew the company from a local retailer to an international designer, manufacturer and distributor of unique outdoor furniture now servicing over 1,000 retail locations across the U.S. Steve Lowsky will continue to lead Pride as CEO, and Jamie Lowsky will continue his activities with the company, as well as serve on the Company’s Board of Directors. “Pride Family Brands is a great company with strong brands, uniquely positioned for significant growth. We are excited to partner with Steve, Jamie and Victor Wolf, EVP of our Costa Rican Affiliate, and look forward to assisting the company in achieving its strategic initiatives,” stated John Disa, Partner at New Water Capital. Farlie Turner & Co. acted as financial advisor to Pride. New Water Capital is focused on investing in lower middle market companies with revenues of $30 – $300 million in the Consumer Products, Retail and Industrial Manufacturing and Services industries. New Water is differentiated through its ability to bring the experience, resources and sophistication of large scale investment firms to lower middle market companies where they can meaningfully impact business performance.